MK Rabbi Yisrael Eichler is a rare breed of Israeli politician — candid in his views and not afraid to share them. 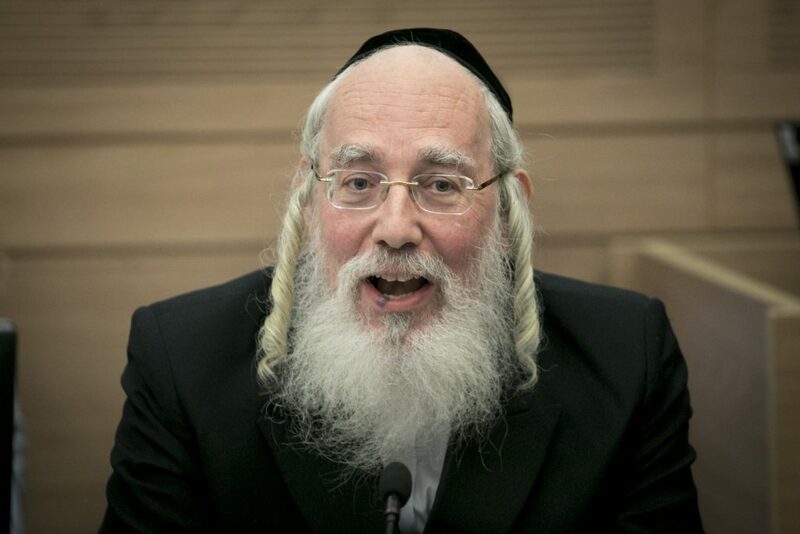 A Belzer Chassid and father of a large family, United Torah Judaism party MK Rabbi Eichler got his start in politics in 2003, after years of working as a journalist, lecturer and editor of HaMachane HaHaredi. Rabbi Eichler is currently a member of multiple Knesset committees and serves as chair of the Special Committee for Public Petitions. He continues to write a weekly column for HaMachane HaHaredi and is outspoken on safeguarding the sanctity of Eretz Yisrael. Rabbi Eichler, in an exclusive interview with Hamodia, shares his candid views with our readers on matters of importance to the Torah world. How did you become involved in Israeli politics? I was an author and journalist for 40 years. As a Belzer Chassid and representative, I did kiruv on kibbutzim, in the army, and as a [media] spokesman. Fifteen years ago, I joined the Knesset as part of Agudas Yisroel, and I have been in politics ever since. For me, politics and media are the same thing. Journalism is politics and politics is journalism. A veteran journalist once told me that every journalist is a frustrated politician. What are your thoughts on the recent Knesset compromise on the draft law, which avoided a collapse of the ruling coalition? Every boy who wants to learn should not go to the army. It was like this for 70 years and, iy”H, it will be like this for the next 70 years. But the question is how to make it into law. Several months ago, the Supreme Court canceled legislation exempting yeshivah students from the draft, claiming it was unfair. They gave us until September to fix the law. But jeopardizing our position in the government now is a problem. We don’t know what tomorrow brings. You’ve been very vocal about the Kosel controversy and the importance of maintaining the status quo. Despite their waning influence among secular Jews and the fact that many of them are not even halachically Jewish, the Reform and Conservative falsely claim to represent American Jewry. Would you agree that they are making the Kosel issue their battle cry in an effort to maintain relevance and dominance over a growing Orthodox sector? Yes. The idea that the Reform and Conservative represent Diaspora Jews is a lie. The Reform have complete access to the Kosel. It’s open to everyone — Jew and non-Jew. The problem is that there are some organizations and foundations, with a lot of money, that are agitating among the Reform against the Orthodox. They claim that the Reform are not welcome at the Kosel, that Israel doesn’t want to accept their children as Jewish, and that the Orthodox want to drive them out of Judaism’s fold. They convince the Reform to pay them money to defend them against the Orthodox. This is a very terrible situation. It’s all lies. Look at the Women of the Wall. For 20 years they come once a month to make a provocation. It’s their parnassah. In Mecca, no one would dare to be “mechallel Mecca.” If someone would try to make a provocation there, it would be a desecration of their holy place. Why should demonstrations and provocations be allowed at the holiest place in the world for the Jewish people? It’s a terrible chillul Hashem. In Israel I do not say that I am Orthodox. I don’t know what “Orthodox” is. I am a Jew. The Jew has the Torah; his constitution is chukas haTorah. What is Reform, Orthodox, Conservative? These are just political divisions. These divisions are more than political; they are fundamental. You define yourself as shomer Torah umitzvos, but the Reform and Conservative openly flout Torah umitzvos. Even if someone doesn’t keep Torah umitzvos, he is still a Jew, not a “reformer.” A “reformer” is someone who wants to change Judaism, like the Christians who set out to change Judaism. The Reform and Conservative are like the Christians and Moslems; both of their roots are in Judaism. But even if a Jew is not religious, I want him to be on our side about the Kosel and about Israel; not with BDS, not with organizations that send demonstrators to agitate at Israel’s borders. How can they represent the Jews in America? The problem is that the Orthodox Jews in America don’t go to Netanyahu and are not heard. There was an Orthodox delegation that recently went to Israel to lobby on behalf of the Orthodox position on the Kosel. Do you think this is enough? What else should American Orthodox Jews do? I don’t think it is enough. I think Orthodox American Jews should be involved with three things: public relations, public relations and public relations. There are many ways to be involved in PR. The Reform and Conservative started to use PR in Israel 25 years ago. Everyone laughed at the time. They said, “Who are they? Ten people? Twenty people?” But they had lots of money and bribed Israeli officials with shochad chuki, legal bribes. They took judges, like Aharon Barak, and invited him and his wife to give speeches in American universities. They bought sets of books that Barak authored and donated them to all the libraries in America to promote Barak’s works and ideas. He got a lot of honor and money in a legal way, not under the table. That’s OK, but Netanyahu getting some cigars is not OK? (Laughter) This is the law. It’s legal for a judge to give speeches and sell books. Aharon Barak has bought 13 villas in Yerushalayim on a judge’s salary. So when he sits in the court, and the Reform and the leftists come with their agenda, which tries to undermine Israel regarding building in the settlements, nachluyot, destroying houses in the settlements — everything the Reform want they get. How? Because he essentially works for them. The same goes with Knesset members. Every month they take Knesset members for tours in Jewish communities through the Federation. They put them up in hotels, take them to conferences and parties, and it’s all legal. It’s illegal to give Knesset members money, but it’s legal to invite them to communities and have them speak. I heard that Shuli Mualem, the religious MK from Jewish Home, was on tour in America recently and not one Orthodox community invited her to speak. Only the Reform and Conservative communities did. I spoke at the Agudah convention several years ago and pointed out what they’re doing. I implored them to invite Knesset members to Boro Park, to Flatbush. Invite judges and journalists so they can see Orthodox Jewish schools and communities. But they do nothing! Apathy among the Orthodox is a problem, but don’t you think that it’s also important for Israeli policymakers to educate Israelis, who for the most part are unfamiliar with the dangers of the Reform and Conservative? Even the religious Attorney General of Israel, Avi Mandelblit, endorsed the use of the Southern Wall for the Reform and Conservative and went so far as to sanctify their entitlement to a representative who’s not part of the Rabbanut. How can the Orthodox in America confront that? You’re right, every word is right. Some frum people in Israel fear that if they don’t give in to the Reform, then the Supreme Court will intervene and rule in their favor. They are misguided and think that they are saving the Kosel by compromising. But if G-d forbid the Supreme Court rules against Halachah, then they will be responsible. I can never agree to give the Reform any authority over a part of the Kosel, because then I will be guilty of enabling them and desecrating the Kosel. The problem is not [whether or not one is] able to pray at the Kosel. That was never a problem. Everyone is allowed to pray there. The Kosel is for everyone; there are laws that apply to everyone. But the Reform want authority just like the Palestinians want authority. And there will be no end to it. Next thing we’ll have [Christian missionaries] demanding authority. The Kosel is a status–quo issue like the Shabbos. If the religious parties were recently able to push through the Shabbos laws, why can’t they do the same to safeguard the status quo of the Kosel? The Kosel issue is a status quo issue and we are fighting with the Rabbanut against the government, against the Supreme Court, against the Jewish Agency and Natan Sharansky, the head of it. But Shabbos is a different issue. The shittah of the Belzer Rebbe is to implement Shabbos by example, by inspiring families, one family at a time. It’s impossible to coerce over a million people who are not shomrei Shabbos to keep the Shabbos. It won’t work. Passing the Shabbos Law not only does not help but will harm us when it comes to the topic of conversion. But weren’t you in favor of passing the Shabbos Law? Yes. We had to support the Shabbos law at any price. But afterward, I realized that we wasted a lot of [political] capital. On the morning when the Shabbos law passed, I brought up the subject of Chok Hagiyus (draft law) to Netanyahu. He told me, “Enough is enough.” I understood then that we have a problem — the draft law is more controversial and we wasted too much capital over the Shabbos law. As a Belzer Chassid and a politician, do you ever see a contradiction between your identification as a chareidi and your support for the Medinah? The medinah is like a pot. Whatever you put in the pot is what you have. Of course, I support a Jewish state, not like [some sects] who oppose a Jewish state even if it’s a Yiddishe one. I support a democratic Jewish state. But a medinah whose government, security, and culture is anti-Torah is neither a Jewish state nor a democratic state. It’s not a Jewish state because a Jewish state should be Jewish. Here, religious laws are nothing, gornisht. But chiloni laws are upheld. And culture too. The budget for culture is allotted solely for secular and for anti-religious purposes. So this is not a Jewish state. It’s anti-Jewish. It’s not democratic, because a democracy is supposed to recognize all branches of government. But if the Supreme Court overturns the government’s legal rulings one after another, and then the police uphold the Supreme Court’s decisions — that’s not a democracy. I support a Jewish state, even if it’s not religious, because I recognize that there are non-religious people. There can be chilonim in such a State, but the State itself should not be chiloni. You can’t force people to be religious. Even in Jewish homes you can’t force all your children to adhere to your level of religiosity. So as a Jew who wants to support a Jewish State, I am a part of the right-wing coalition in the Knesset, because it’s more Jewish than the left-wing, which is anti-Jewish. The State of Israel just celebrated its 70th anniversary. Would you agree that one of the biggest challenges facing Israel today is a threat to its Jewish identity? Sure, because without a Jewish identity, all the Israelis go to the Unites States. Today, there are one million Israelis in the United States; 20 years ago there were half a million. Every Israeli without a job flees. If there will be a war, what keeps a Jew in Israel? Only his Jewish identity. If there is Jewish identity, then someone will want to live in Israel. But someone who doesn’t identify as a Jew, why should he live here? Without it, there’s no reason for the State of Israel to exist.